Wishing You & Yours A Very Blessed & Beautiful Imbolc! Till tomorrow, my sweets…. and the souls of all I meet today. no hatred or fear, may smother the flame. that it may burn brightly through this season. so that all may know the comfort of Brigid’s love. Imbolc (pronounced “IM-bulk”, “IM mol’g” or “EM-bowl/k”) is one of the Greater Wiccan Sabbats and is usually celebrated on February 2nd. In the Celtic tradition it is celebrated on February 1st or the first Full Moon in Aquarius. Other names Imbolc are known by include Imbolg, Imbolic (Celtic), Imbolgc Brigantia (Caledonii Tradition, or the Druids), Candlelaria (Mexican Craft), Disting (Teutonic Tradition – celebrated on February 14th) Candlemas (some Pagan Traditions and/or individuals prefer this name), the Feast of Candlemas and St. Bridget’s Day (Christian), Oimelc, Brigid’s Day, Lupercus (Strega), the Feast of Lights, the Feast of the Virgin, the Snowdrop Festival, or the Festival of Lights. The name “Imbolc” or “Oimelc”, which is derived from Gaelic, means “ewe’s milk” after the lactating sheep that are feeding their first born lambs of the new season at this time of year. In many Wiccan traditions, Imbolc is celebrated as the point in the year when the Goddess recovers from giving birth to the Sun. The young God grows from an infant to a child. It is a time when the growing light promises the return of springtime. Many Wiccans tend to focus their rituals on the Maiden aspect of the Goddess at this time as well. In Celtic lore, the Goddess Brighid, is primarily worshiped because of her triple aspect as the patroness of smith-craft(fire), healing and inspiration. These sayings agree with those about Groundhog Day that link the length of winter to whether or not the groundhog sees his shadow on this day. An old northern English name of Candlemas is the Wives’ Feast Day. The festival of Candlemas has ancient roots, for in Pagan Europe, fires were kindled at this time of year to reflect and encourage the growing strength of the Sun. It’s name is Christian, however, being derived from the tradition of the future year’s supply of candles being blessed before the first mass of February 2, and then being carried around the church in a pious procession. This is also the feast of the purification of the Virgin Mary and the presentation of the infant Jesus in the Temple; the parallels between the Virgin Mary and the Goddess in Her maiden aspect, and Baby Jesus and the solar child of promise, are unmistakable. White represents purity, pale gree denote a fresh start and growth, and a flame signifies the kindling of creativity. Light candles of these colors to commemorate the concepts symbolized by Candlemas. As you gaze at the flaming taper, ask the Goddess for inspiration. Fire in the head…to quicken us. Fire in the cauldron…to heal us. Fire in the forge of the heart…to temper us. In Irish mythological cycles, Brighid (or Brighit), whose name is derived from the Celtic brig or “exalted one”, is the daughter of the Dagda, and therefore one of the Tuatha de Dannan. Her two sisters were also called Brighid, and were associated with healing and crafts. The three Brighids were typically treated as three aspects of a single deity, making her a classic Celtic triple goddess. Brighid was the patron of poets and bards, as well as healers and magicians. She was especially honored when it came to matters of prophecy and divination. She was honored with a sacred flame maintained by a group of priestesses, and her sanctuary at Kildare, Ireland, later became the home of the Christian variant of Brighid, St. Brigid of Kildare. Kildare is also the location of one of several sacred wells in the Celtic regions, many of which are connected to Brighid. Even today, it’s not uncommon to see ribbons and other offerings tied to trees near a well as a petition to this healing goddess. 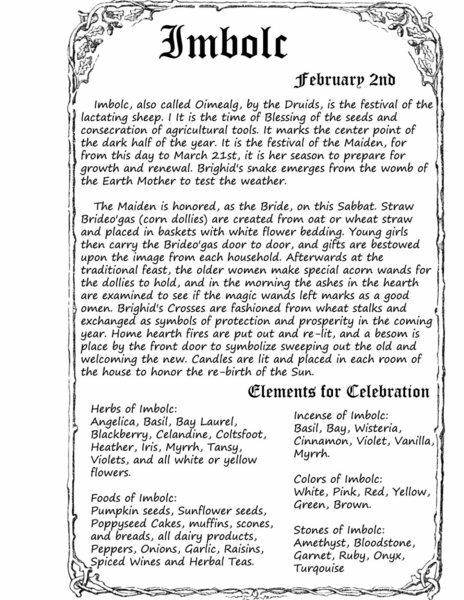 There are a variety of ways to celebrate the many aspects of Brighid at Imbolc. If you’re part of a group practice or a coven, why not try honoring her with a group ceremoy? 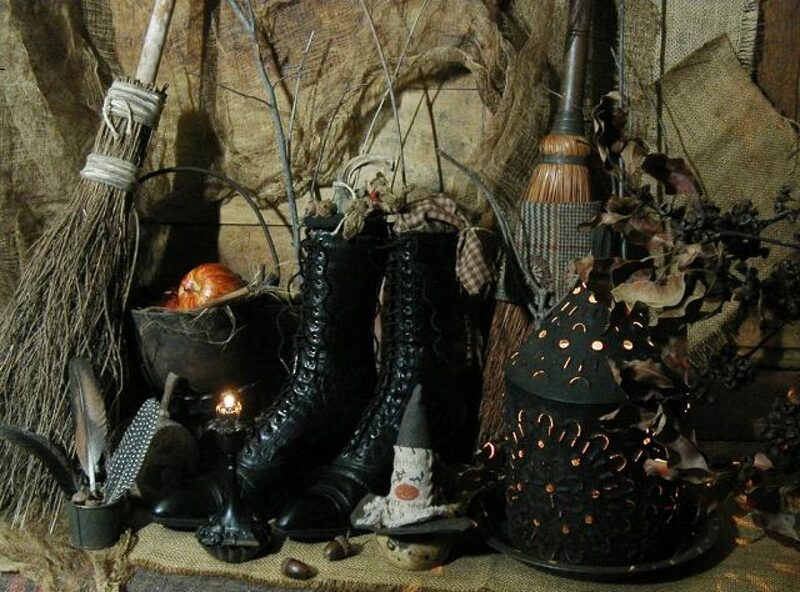 You can also incorporate prayers to Brighid into your rites and rituals for the season. Having trouble figuring out what direction you’re headed? Ask Brighid for assistance and guidance with a crossroads-themed divination rite. In northern Britain, Brighid’s counterpart was Brigantia, a warlike figure of the Brigantes tribe near Yorkshire, England. She is similar to the Greek goddess Athena and the Roman Minerva. Later, as Christianity moved into the Celtic lands, St. Brigid was the daughter of a Pictish slave who was baptized by St. Patrick, and founded a community of nuns at Kildare. In addition to her position as a goddess of magic, Brighid was known to watch over women in childbirth, and thus evolved into a goddess of hearth and home. Today, many Pagans honor her on February 2, which has become known as Imbolc or Candlemas. One commonly found symbol of Brighid is her green mantle, or cloak. In Gaelic, the mantle is known as the brat Bhride. The legend has it that Brighid was the daughter of a Pictish chieftain who went to Ireland to learn from St. Patrick. In one story, the girl who later became St. Brighid went to the King of Leinster, and petitioned him for land so she could build an abbey. The King, who still held to the old Pagan practices of Ireland, told her he’d be happy to give her as much land as she could cover with her cloak. Naturally, her cloak grew and grew until it covered as much property as Brighid needed, and she got her abbey. Thanks to her roles as both a Pagan goddess and a Christian saint, Brighid is often seen as being of both worlds; a bridge between the old ways and the new. In Celtic Pagan stories, Brighid’s mantle carries with it blessings and powers of healing. Many people believe that if you place a piece of cloth out upon your hearth at Imbolc, Brighid will bless it in the night. Use the same cloth as your mantle each year, and it will gain strength and power each time Brighid passes by. The mantle can be used to comfort and heal a sick person, and to provide protection for women in labor. A newborn baby can be wrapped in the mantle to help them sleep through the night without fussing. To make a Brighid’s mantle of your own, find a piece of green cloth long enough to comfortably wrap around your shoulders. Leave it on your doorstep on the night of Imbolc, and Brighid will bless it for you. In the morning, wrap yourself in her healing energy. You can also make a Brighid’s cross or a Bride’s Bed to celebrate her this time of year. 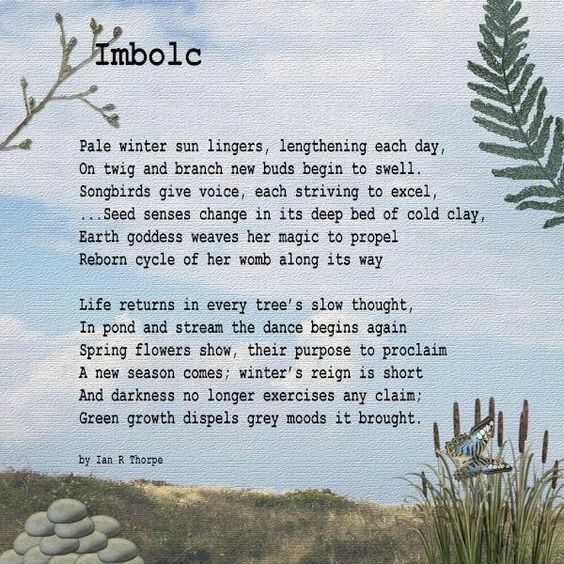 Like many Pagan holidays, Imbolc has a Celtic connection, although it wasn’t celebrated in non-Gaelic Celtic societies. The early Celts celebrated a purification festival by honoring Brighid. In some parts of the Scottish Highlands, Brighid was viewed as a sister of Cailleach Bheur, a woman with mystical powers who was older than the land itself. In modern Wicca and Paganism, Brighid is sometimes viewed as the maiden aspect of the maiden/mother/crone cycle, although it might be more accurate for her to be the mother, given her connection with home and childbirth. Imbolc is a time when the Wheel of the Year has reached a crossroads between light and dark. The earth is about to quicken, and yet no one knows exactly what lies ahead of us. There are twists and turns on the path to come, although where it leads is anyone’s guess. Among her many aspects, Brighid is considered a goddess of the crossroads. She is said to be able to see where we’ve been, and where each road might take us, should we choose to follow it. A Brighid’s Cross unites the four elements, and creates paths which travel in the four directions. Because of this, Imbolc is an ideal time for divination. Not sure where your headed this year, or what choices lie before you? Let Brighid help guide you as you weave a crossroads of your own in her honor. As you create a Brighid’s Cross as part of this divination, ask her to inspire you, and guide you towards the right path in the coming months. For this divination, you’ll want to find a place where you can be alone and undisturbed. If it’s warm enough, try to get outside, perhaps out in the woods where two paths intersect. Before you begin, read the instructions here on how to Make a Brighid’s Cross. Have all your supplies on hand prior to beginning your divination ritual. Begin by closing your eyes, and thinking about where you’ve been in the past year, spiritually, emotionally, even physically. What things have you done that bring your regret? What things have brought you joy? Is there anything you wanted to do, but didn’t get a chance to? Picture yourself wandering along a path, out of the past and into the present. Let your mind roam freely, and visualize yourself approaching a crossroads. Perhaps it’s a place in a forest, where a pair of deer trails run together. Maybe it’s in the mountains, where streams intersect. Or maybe you picture yourself out in a wide open space, with roads connected in the middle of nowhere. Regardless, see yourself at that crossroads. You are at the center, and branching out from where you stand are many paths. Each leads in a different direction. Each path will take you to something new. Begin creating your Make a Brighid’s Cross, and as you weave the straws together, think about what may lie in each direction. As you look out over your choices, thinking about which way to travel, Brighid herself is standing beside you. Continue weaving your cross, and watch her. She points out one of the roads. When you’ve finished your cross, close your eyes once more, and meditate on the path which Brighid indicated for you. What lies in that direction? Is it something familiar and comforting? Something new and unknown? Focus on the cross you’ve made, and let this newly chosen path inspire you. Know that it will ultimately bring you to something good and positive and strong. The goddess Brighid (also known as Brigit, Bride, Biddy and other names throughout Europe) is a goddess who is near and dear to my heart for many reasons. I like the fact that she is associated with both water (her wells in Kildare and other parts of Ireland) and fire (her fire pit in Kildare). I like the fact that she spans both the pagan and Christian worlds and some of her traditions are still celebrated today. That is a sorry complaint. Cormac mac Cuillenàin, who lived in the 9th century said, “Brighid i.e. a learned woman, daughter of the Dagda. That is Brighid of learning, i.e. a goddess who filid worshipped. For her protecting care was very great and very wonderful. So they call her a goddess of poets. Her sisters were Brighid woman of healing, and Brighid woman of smithcraft, daughters of the Dagda, from whose names among all the Irish a goddess used to be called Brighid” In this writing, Cormac mentions her triple aspect of three sisters, common among the Celts. I often call on one or more of her aspects of creativity, writing and healing, but she is much more than that. The Christian aspects of Brighid and the pagan aspects often overlap, so it’s difficult to figure out which stories have pre-Christian beginnings. I think there is a seed of paganism in many of the later stories associated with her. We’ll never know for sure, but in my own private practice I take many of her current customs and use them for my own worship of her – and I don’t worry about the pre-Christian aspect of the story or not. Your mileage may vary, of course. On the eve of Imbolc, a piece of linen, other cloth or ribbons is placed outside (some folks put them on their window sill). This piece of cloth is called Brighid’s Brat or Brighid’s Mantle. It is said that Brighid travels all over the land on Imbolc eve and if she sees this cloth, she will bless it and give it healing powers. Some folks in Ireland say that the older your brat is, the more powerful it is. Mugwort Grove (the grove to which I belong) destroys ours from year to year. We put out a whole piece of linen and tear it into strips for members of the Grove during our Imbolc ritual. People take the strips home to use for healing and some are kept on personal altars throughout the year. Other folklore says that if the mantle gets bigger overnight, you will be especially blessed. It’s a nice tradition, especially if you have a lot of illness to overcome for the following year, and a brat is nice to have for healing rituals later in the year. Brighid’s fiery aspect makes her the perfect goddess of the hearth – in fact, my hearth at home is dedicated to Brighid. There are many hearth prayers dedicated to Brighid, especially concerning smooring. Ashes and embers were often deposited in the fields. Also, indoor activity associated with Imbolc often took place near the hearth, and if there was a feast, an extra place was set for Brighid. It is also considered bad luck to do any type of spinning on Brighid’s Day. There is also the custom of Brighid’s Bed. A small bed is made near the hearth and a doll (called a Brídeog), often made from a sheaf of corn and made into the likeness of a woman and is sometimes placed in the bed. In Ireland the doll was often made from a churn dash decorated in clothing (associations t milk again). Sometimes the doll was carried around town to visit houses in the neighborhood. Songs, music and dances are performed – then prayers are said to St. Brighid for blessings upon the house (this is similar to wassailing in other countries around Christmas). Then the family is asked to contribute a donation – which used to be bread and butter (there’s that dairy again!) but now it’s often money (sometimes given to charity). There is much, much more about Brighid I could share, but this is just the tip of the iceberg. A bit of trivia – Brighid is so loved by the Irish people that in 1942 a survey was taken on “The Feast of St. Brighid”. The replies about the customs run to 2,435 manuscript pages. A great book, if you can find it, is The Festival of Brighid Celtic Goddess and Holy Woman by Séamas Ó Catháin. There are many really cool stories and legends about her. I would like myself to be a rent payer to the Lord; that I should suffer distress, that he would bestow a good blessing upon me. I would like to be watching Heaven’s family drinking it through all eternity. The Celtic festival of Imbolc celebrates the return of Spring from underground and the soul to renewed life. These myths are not only about the return of Spring to the land, but also the return of the Soul–traditionally depicted as feminine–from its dwelling in the obscurity of the subconscious mind. In the western world, we tend to get so caught up in material pursuits that the soul is forgotten most of the time – even though we never feel truly at home to ourselves without that connection. At the dawn of the modern age, a poet wrote that “affairs are now soul size.” His words are even more true today: with the escalating crises in the world from wars to global warming, now is the time to fully awaken into what each of us has been called to do during our time on Earth, to emerge into a life that catches fire from the soul-flame within each of us. When humanity listens to the voice of the soul, rather than being seduced by the astral glamour of consumer-driven culture, then the Soul of the World, the Anima Mundi, will also emerge, like Bride or Persephone, from deep within the Earth where it has been hidden, and its long estrangement from the human race will be over. This is the true meaning behind the Quest for the Holy Grail, a symbol of the Divine Feminine that was withdrawn from the world when our insatiable desire for dominance turned it into the Wasteland. For the Grail to be found, for the Wasteland to be restored to the Courts of Joy, we must learn to become co-creators in partnership with all the Living Intelligences of our planet: human, animal, faery or Devic. The Festival of Bride is also known as Candlemas, for it is marked by the lighting of candles to brighten the long February nights. This also gives us an opportunity to rekindle our own inner flame upon the shrine of the soul. So light your own candle this season, and as you do so, see this tiny flame as a spark of the One Light that shines through all the worlds. Then sense your own inner flame within your heart and know that you, too, are a spark of the Divine. Breathe in the peace of this knowledge, and listen to your soul telling you how to fully awaken into Light in the emerging year. To the Romans, this time of year halfway between the Winter Solstice and the Spring Equinox was the season of the Lupercalia. For them, it was a purification ritual held on February 15, in which a goat was sacrificed and a scourge made of its hide. Thong-clad men ran through the city, whacking people with bits of goat hide. Those who were struck considered themselves fortunate indeed. This is one of the few Roman celebrations that is not associated with a particular temple or deity. Instead, it focuses on the founding of the city of Rome, by twins Romulus and Remus, who were suckled by a she-wolf — in a cave known as the “Lupercale”. The ancient Egyptians celebrated this time of year as the Feast of Nut, whose birthday falls on February 2 (Gregorian calendar). According to the Book of the Dead, Nut was seen as a mother-figure to the sun god Ra, who at sunrise was known as Khepera and took the form of a scarab beetle. When Ireland converted to Christianity, it was hard to convince people to get rid of their old gods, so the church allowed them to worship the goddess Brighid as a saint — thus the creation of St. Brigid’s Day. Today, there are many churches around the world which bear her name. For many Christians, February 2nd continues to be celebrated as Candelmas, the feast of purification of the Virgin. By Jewish law, it took forty days after a birth for a woman to be cleansed following the birth of a son. Forty days after Christmas – the birth of Jesus – is February 2nd. Candles were blessed, there was much feasting to be had, and the drab days of February suddenly seemed a little brighter. In Catholic churches, the focus of this celebration is St. Brighid. February is known as a month when love begins anew, in part to to the widespread celebration of Valentine’s Day. In some parts of Europe, there was a belief that February 14th was the day that birds and animals began their annual hunt for a mate. Valentine’s Day is named for the Christian priest who defied Emperor Claudius II’s edict banning young soldiers from marrying. In secret, Valentine “tied the knot” for many young couples. Eventually, he was captured and executed on Feb. 14, 269 C.E. Before his death, he smuggled a message to a girl he had befriended while imprisoned — the first Valentine’s Day card. Among agricultural societies, this time of year was marked by the preparation for the spring lambing, after which the ewes would lactate (hence the term “ewe’s milk” as “Oimelc”). At Neolithic sites in Ireland, underground chambers align perfectly with the rising sun on Imbolc. Brighid is known as one of the Celtic “triune” goddesses — meaning that she is one and three simultaneously. The early Celts celebrated a purification festival by honoring Brighid, or Brid, whose name meant “bright one.” In some parts of the Scottish Highlands, Brighid was viewed in her aspect as crone as Cailleach Bheur, a woman with mystical powers who was older than the land itself. Brighid was also a warlike figure, Brigantia, in the Brigantes tribe near Yorkshire, England. The Christian St. Brigid was the daughter of a Pictish slave who was baptized by St. Patrick, and founded a community of nuns at Kildare, Ireland. White flowers, marigolds, plum blossoms, daffodils, Brigid wheel, Brigid’s cross, candles, grain/seed for blessing, red candle in a cauldron full of earth, doll, Bride’s Bed; the Bride, broom, milk, birchwood, snowflakes, snow in a crystal container,evergreens, homemade besom of dried broom, orange candle annointed in oil can be used to sybolize the renewing energy of the Sun’s rebirth. The time has come to call and welcome the forces of light! Candlemas or Imbolc is the mid point of the dark half of the year. We welcome the rebirth and awakening of the Earth, the earliest beginnings of Spring. renew the earth. A celebration of fertility. Traditionally, Imbolc is a time to prepare for the goals one wishes to accomplish in the coming months, and to clarify and redefine our personal projects which were begun at Yule. the fires of Imbolc represent our personal illumination and inspiration, a celebration of ideas yet to be born. Imbolc has also become a time for new initiations into covens, self-dedication, and renewal of our bows. It is also a time for purification of oneself. The colors for Imbolc are lavender, white and pink. Herbs include Heliotrope, Carnation, Poppy, Basil and Violet. Stones used for this celebration may include Amethyst for peace of mind or jet for heightened intuition and inner sight. Offerings of cakes and wine may be presented to the Lord and Lady, to seek their assistance in helping to ignite your creative fires and energy. May the fires of Imbolc burn brightly within all of you throughout the coming year! Each year, we celebrate February 2nd around the world. We call it Brigid, Candlemas, Imbolc, St. Brigid’s Day, and yes, of course, Groundhog’s Day. Why do we celebrate on February 2nd? Is it like President’s Day – providing a nice day for state and federal workers to stay at home? Not really… Brigid has been celebrated for many thousands of years. It is the day on which we recognize and honor the awakening of the maiden aspect of the Goddess. Some of us celebrate the holiday as Brigid, in honor of Brigid who was a Celtic Goddess of poetry, healing, fire and smithcraft. In years past, the people of the British Isles would build a nice fire in their hearth, light torches and candles, and celebrate Brigid. What were they celebrating? The Maiden aspect of the Goddess awakes or returns from the underworld. At Winter Solstice she was impregnated with Spring. She sleeps until Brigid and returns, bringing Spring and renewal for the earth with her. The other names for this holiday are just different names for the same celebration. what is upcoming for us. We may not even recognize it. We may not even think about it consciously, but subconsciously we are very much aware of it. We are very much a part of the spiral of birth, death, and rebirth throughout the year. We are interconnected with the earth and all that is on it. You have likely heard the old expression “Spring Fever” many times before. This is simply our anticipation of Spring’s return, when we can go out and live a full life upon the earth once more. Often if we look at our ancestors and the His/Herstory, we can find the answers to many of our questions. 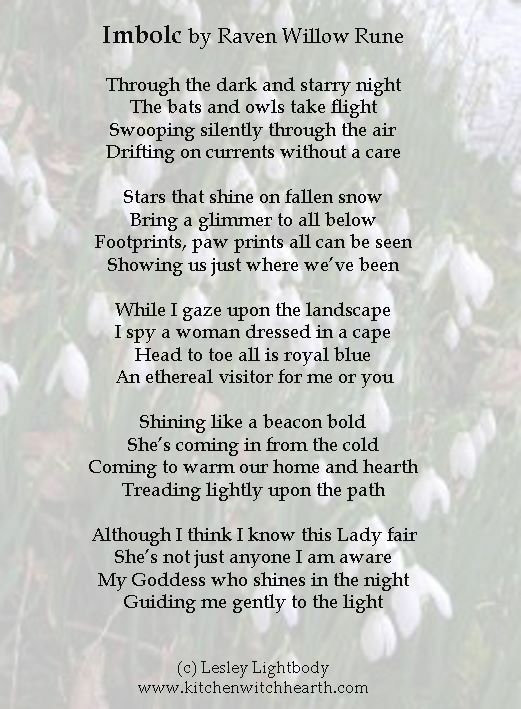 I hope that everyone has a beautiful Brigid and remember… Spring is just around the corner. This psychic protection spell requires some visualization on your part. To begin, I recommend working this spell in daylight hours. Bundle up as needed and stand outside in nature, with your feet securely on the ground. Tip your face up to the February sun… know that its strengthening rays are slowly bringing life back. Spring is coming, and winter will lose its grip on the land. During this in-between time as winter fades and a new season of growth awaits is your best opportunity to clear out any old negativity, psychic goop, or unhappiness that you may be carrying around. It’s also an excellent time of the year to strengthen your personal psychic protection. So let’s get started! As you repeat this spell verse, imagine that sunlight swirls around you in a colorful stream; it’s your call as to whether the energy streams clockwise or counterclockwise, so go with whatever seems correct to you. The light you are visualizing can be any color or a rainbow of colors, so feel that sunlight and get the circle of energy spinning around. This psychic protection magick around me spins. And strengthens this magick from where I stand. I am refreshed and ready for whatever comes my way. Serenity, hope, health, and strength this magick does bring. Allow your hands to come down to your sides, and let the energy follow the motion of your hands so it grounds itself back into the earth. Take a nice cleansing breath in, hold it for four counts, and then slowly blow it out. As I will, so mote it be, an’ let it harm none. Give your whole house a thorough cleaning at the end of winter. A clean physical space feels good spiritually. Be sure to clean your windows so they’re free of winter’s grime. No one really likes to clean, but we all know we feel better when our physical space is tidy. It’s one of life’s necessary chores. Start your spring off with a good thorough cleaning, and then follow that up with a spiritual cleansing. This is a great ritual to perform at Imbolc — remember that for many of our ancestors, washing came only a few times a year, so by February, a house was probably smelling pretty ripe. Pick a bright sunny day to do a clean sweep, and then invite friends and family to join you in a blessing of your home. First, do a complete physical cleaning of your house. Put on some music and thoroughly clean every room. Strip sheets off the beds, turn the mattresses, dust every surface, and vacuum every floor. Sort through those piles of paper on your desk, and get rid of things you don’t need to keep; file everything else. Gather up the kids’ toys and put them in baskets for easy storage. If you need to get rid of things, do it now — set aside a box for charity and put gently used items in it. Set aside another box for trash, and see if you can fill it up! Once your house is clean — and this assumes you did the kitchen as well — it’s time to have some fun. Call up some friends and invite them over for a potluck. Cook up some Imbolc-themed comfort foods, such as Braided Bread or Beer Battered Fish & Chips, and have a small potluck celebration. Ask each guest to bring a small token to bless your house — pebbles, shells, interesting bits of wood, beads, etc. With the purifying power of water, with the clean breath of air, with the passionate heat of fire, with the grounding energy of earth we cleanse this space. May the goddess bless this home, making it sacred and pure, so that nothing but love and joy shall enter through this door. Finally, once you’ve gone through the house, ask each of your guests to deposit their blessing token in your bowl or bag. Keep it in a place of honor in your home — on the mantel or in your kitchen is a good idea. Gather around the dinner table, break out the goodies, and enjoy a feast with your friends and family! * If you don’t have Blessing Oil, you can use rosemary oil instead. Make your own by infusing fresh rosemary in grapeseed or flaxseed oil. Imbolc is a festival of light — celebrate it with candles and flames! ** Note: although this ceremony is written for one, it can easily be adapted for a small group. Prior to beginning your ritual, take a warm, cleansing bath. While soaking, meditate on the concept of purification. Once you’re done, dress in your ritual attire, and begin the rite. Although it is now dark, I come seeking light. In the chill of winter, I come seeking life. I call upon fire, that melts the snow and warms the hearth. I call upon fire, that brings the light and makes new life. I call upon fire to purify me with your flames. This light is a boundary, between positive and negative. That which is outside, shall stay without. That which is inside, shall stay within. Like fire, light and love will always grow. Like fire, wisdom and inspiration will always grow. Fire of the hearth, blaze of the sun, cover me in your shining light. I am awash in your glow, and tonight I am made pure. Take a few momemnts and meditate on the light of your candles. Think about this Sabbat, a time of healing and inspiration and purification. Do you have something damaged that needs to be healed? Are you feeling stagnant, for lack of inspiration? Is there some part of your life that feels toxic or tainted? Visualize the light as a warm, enveloping energy that wraps itself around you, healing your ailments, igniting the spark of creativity, and purifying that which is damanged. Regardless of what religion we grew up with, most of us have favorite memories of things we did every year for specific holidays. These traditions were what made our celebrations special. So what do you do when the holidays you celebrate now aren’t the same ones you grew up with? How do you share the joys of Imbolc with your family? Imbolc (or Candlemas/Brigid/whatever you choose to call this celebration) falls on February 2nd and is a time to honor the quickening of the earth and the first manifestations of spring emerging from winter. 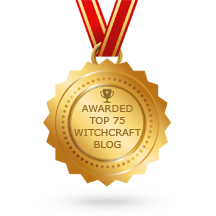 This Sabbat is sacred to the goddess Brigid in particular, and is a wonderful time to acknowledge your own creativity, expand your knowledge, and practice the healing arts. Here are my suggestions to get you started developing your own family traditions! Help your kids go through all their clothes, toys, and books to find the unwanted and outgrown items. Donate everything to a charity that will give the items to children who need them. Collect canned goods from family and friends to give to a food bank. Yule isn’t the only time people are in need. Go for a walk! Search for signs of spring. Take off your shoes and socks and squish your toes in the mud. Open all the doors and windows and turn on every light in the house for a few minutes. Let the kids sweep all the old energies out the doors. Lead the family on a parade around the outside of your home, banging on pots and pans or playing musical instruments to awaken the spirits of the land. Make corn dollies and a cradle for them to sleep in. Create a sun wheel out of stalks of grain and hang it on your front door. Meditate as a family. Have everyone explore what it would feel like to be a seed deep in the earth, feeling the first stirrings of life. Lie on the floor and put out tendrils. Stretch and bloom. Have your children hold some herb seeds in their hands. Talk to the seeds. Bless them with growth and happiness. Fill them with love. Plant an in-door herb garden. Decorate candles with stickers, metallic markers, paint and anything else you can think of! Light your candles and give thanks to Brigid for her inspiration. Help your kids make a special feast! Spicy foods and dairy dishes are traditional. Try Mexican or Indian cuisine. Top it off with poppy seed cake. Drink milk or spiced cider. Set a fabulous dinner table with your candles, evergreen boughs spring flowers, dragons, sun symbols, or whatever says Imbolc to you. Use the good china. Add a piece of rowan and a small hematite, garnet, and clear quartz crystal. A spicy, sunny scent for awakening the earth. To this mixture add a pinch of the first flower (dry it first) that is available in your area at the time of Imbolc (February 1st). Burn during Wiccan ceremonies on Imbolc, or simply to attune with the symbolic rebirth of the Sun — the fading of winter and the promise of Spring. What A Glorious Morning, My Precious Family & Friends, Let Us Rejoice It is Imbolc, The Sun Strengthens, Praise The Goddess For This Glorious Season! A Pre-Happy Imbolc Greeting! Wanted to let you know about our special to you on this Beautiful Imbolc Morning! On special days like today, we like to do our best to do something nice for you, our family. Most of the time it involves sales in the store and this time it still does. We have gotten in a new shipment of capes and we have marked them down so low (it ain’t even funny) plus we are offering free shipment on them. Take a look, remember each of these capes are custom made to fit you. And at these prices, if you have ever wanted a cape now is the time to get one. Here it is….. Happy Imbolc, everyone! Since it is Imbolc we have a very special item on sale for this wonderful Sabbat. We are offering from now till February 16, beautiful hand-crafted Witches capes. Each of these capes are hand-crafted so you are guaranteed to get a custom fit. They are made out of satin, just imagine the feeling of the cape blowing in the wind at your next gathering. Oh, how soft satin feels against the skin. The surface of each cloak is shiny, they are silky soft, and feel comfortable since they are made just for you. This cloaks are unisex and made in sizes S, M, L, XL. Color: Black. Delivery date for our little seamstresses to make these beautiful capes take 15 days since they are all customized to fit. We are offering free shipping on the capes, which we don’t normally due. The total cost of the cape is just $30.00, plus once again, free shipping. Every witch wants his/her own cape and this is the time to get one. So where can you get one, at Magickal Necessities of course. The special is listed on the front page, follow the link there to the capes. Please be sure to include your size when ordering. We will be back shortly with our Imbolc Special!